This two-day workshop on curating performance at the Arnolfini comprised of lectures and artists’ talks considering themes such as the relationship between social spaces, aesthetic experience and the audience, as well as similarities between curator and dramaturge. 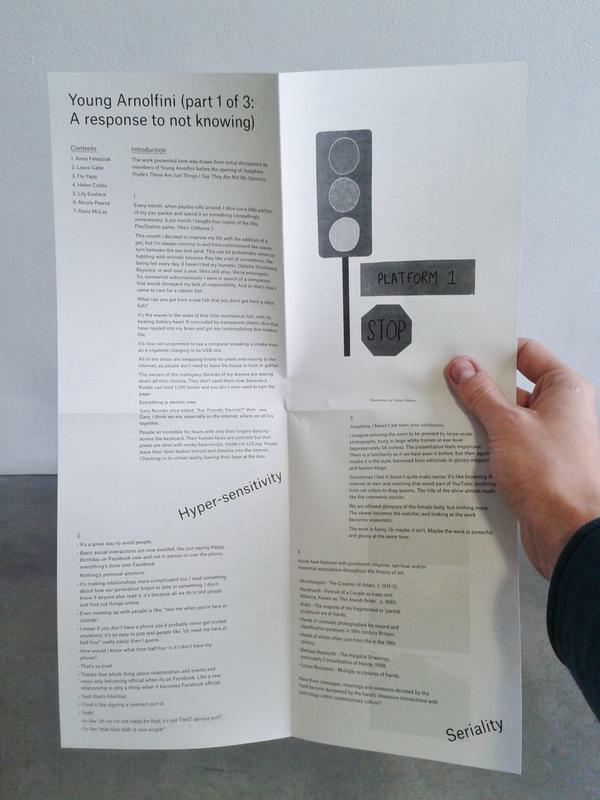 The opportunities and limitations associated with contextualising time-conscious work and live art were also considered. Additionally, notions of staging, movement, image and body were pertinent tropes throughout. Jamie Eastman, the Arnolfini’s curator of performance, introduced the workshop and set the scene by asking the burning and complex question of what is a curator. He suggested a curator was a mediator of live moments, someone who is concerned with the production and presentation of narratives, and whose role links to theatre. Another memorable moment from the introduction was Eastman’s suggestion that the context for live performances is highly important as each event is made up of narratives told in social spaces. Anja Dorn, a curator and guest professor for curatorial theory and dramaturgy at the University of Design Karlsruhe, began the first session with her workshop entitled ‘Curating the Audience’. She offered the notion that the increasing numbers of performance programmes were largely due to consumer culture and attempts to engage with, and even be dictated by, a wider consumer audience. Due to this, performance art takes place in what is called social spaces. (This breakdown of boundaries between art and the public dates back to the 1960s where de-bordering art was taken into new accessible places). From this observation, Dorn was keen for us to discuss how far these social spaces enable aesthetic experience and what implications this powerful consumer culture has for curatorial decisions. I have often thought there is not much in the way for students and young people within the Clifton Village art scene. However, this summer a new contemporary Pop-up, aptly called ‘LITTLEWHITESPACE’, has emerged. Located on Clifton Down Road in-between WHSmith and the old antique shop, it offers an accessible space for hosting exhibitions, galleries and launch events of which there are many this summer. At the moment an exhibition of the artist Abigail McDougall’s work is on display. Her paintings have featured in several magazines including Vogue and Art of England, and last year she was selected as an Artist Member of the RWA. She mostly has watercolour paintings on display, depicting different scenes around Bristol – notably of the Harbourside. 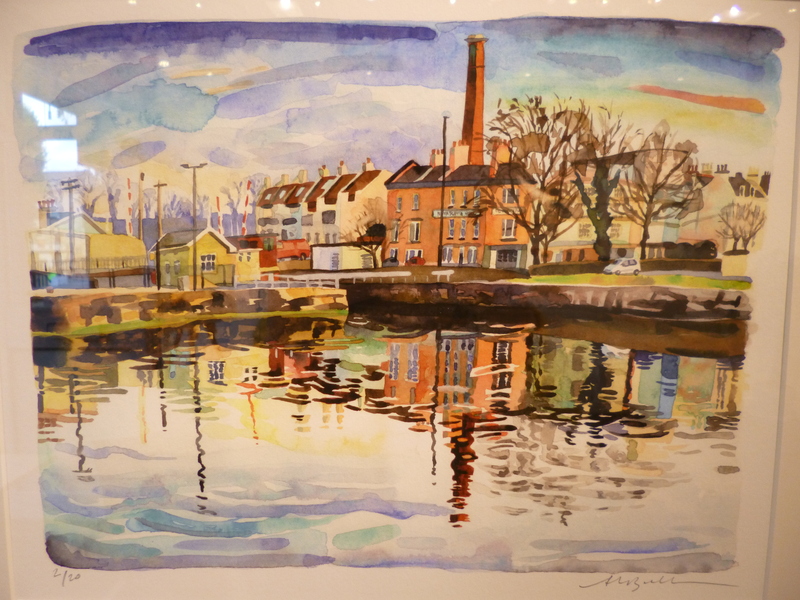 The way she depicts the reflections of Bristol buildings in the water is beautiful. She uses many different blocks of colour to indicate the reflections, which conveys movement and depth in a layering effect. Additionally, the types of brushstrokes used vary from crisp, thin lines to thick, blurring smudges. This gives an interesting contrast between realistic accuracy and an almost tangible blurring of pure colour that reminds us of the painting’s materiality and the medium used to create it. McDougall’s watercolours are striking for the way she chooses bright, invigorating colours. In the past, I have sometimes been uncertain about whether watercolours as a medium can capture scenes of modern urban life, yet in McDougall’s work the watercolours seem fresh, vibrant and modernised. This makes the Bristol scenes seem very sunny and rather tranquil. Another striking thing about the artist’s work is the way areas of the paper have been left white. Apart from this being a watercolour technique for suggesting highlights and reflections, it has the effect of increasing the feeling of space within the scenes depicted. It invites us as viewers to become involved with the paintings and the scenes depicted by encouraging our imaginations to ‘fill in’ the ‘blank’ areas. The paintings in acrylic and oils initially have a slightly brash palette, but do convey a lot of energy and vigour. It is refreshing to see Bristol in this colourful and almost carnival-esque light. 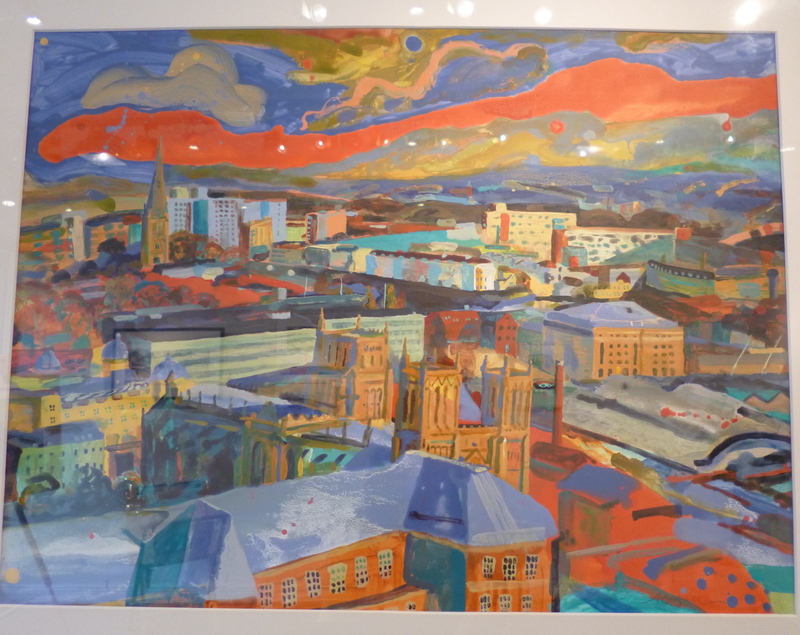 In particular, the acrylic and oil painting called ‘Bristol from Cabot Tower’ gives mythic (and almost turbulent) dreamscape of Bristol. It was great to be surrounded by such positivity – and positivity associated with Bristol. The exhibition definitely felt like a celebration of this city. Along the same lines is a fun exhibition entitled ‘Balloons in Bristol’, starting at LITTLEWHITSPACE on 8th August (until 11th). It will celebrate the Bristol Balloon Fiesta. It is refreshing that the exhibitions at LITTLEWHITESPACE are so pertinent and relevant to Bristol and the current events going on within this city. This is the first time I have written for the Young Arnolfini blog as I have been away at Warwick University, studying for my final year. Now university has finished and I am back in Bristol for the summer it is great to be a part of this group again – and to see how much it has evolved and progressed from the initial meetings I attended this time last year. 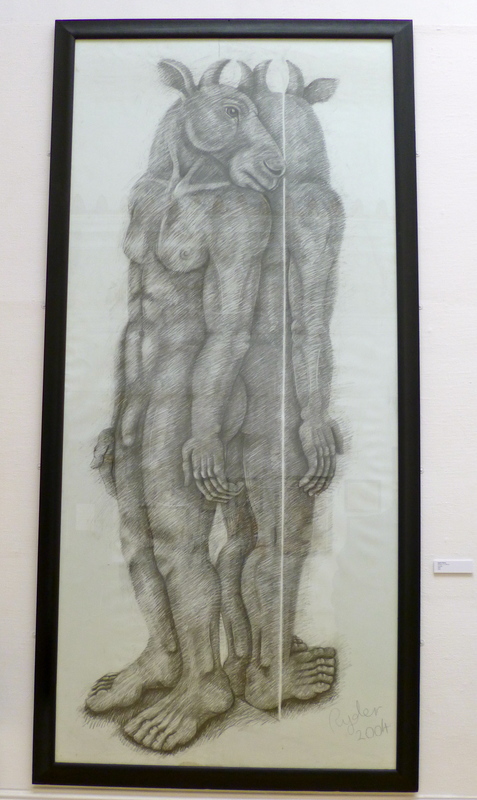 I thought I would begin contributing to the YA blog by sharing some thoughts on one of the drawings that most stood out for me in the current exhibition of Sophie Ryder’s work at the RWA.